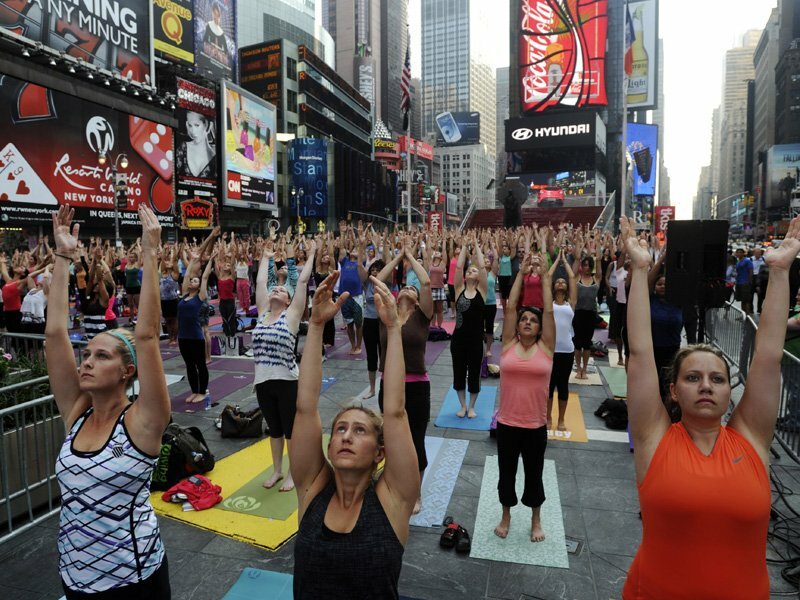 On Wednesday, the ever busy and populated New York Times Square was invaded by over thousands of yoga enthusiasts. The busy street was transformed into an immense outdoor yoga class. The event was to usher in the arrival of summer. According to Douglas Stewart, the co-founder of Solstice in Times Square, the venue was a perfect setting to challenge individuals to free their mind and bring themselves to relax. “It’s an intersection of all places, you know. It’s like a major intersection of a… lots of people are here and broadway shows are here. Different kinds of people with different agendas, all meeting at this place and the busiest place. And so we decided and thought that this would be the perfect place to test that theory,” stated Douglas. This is already the tenth year that the event has been held. On any other regular days, the roads would have been busy with traffic. However, on that day, it was these yoga fanatics that took over the pedestrian spaces in New York’s most frenetic crossroads. Approximately 1,500 yoga mats were distributed for free to some lucky individuals as well. Throughout the day, loudspeakers were used to provide instructions for these thousands of participants as they bask in the warmth of the sun. The event lasted from more than twelve hours. The first class kicked things off at 7:30am and the last class was schedule at 8:30pm at night. This was a full day event, which doesn’t occur on any other ordinary day. Those tourists who were there had the joy of experiencing the New York Times Square in a whole different perspective. For more about the event, you can read it over here and here. For those who haven’t heard of Times Square, it is a major commercial intersection in Midtown Manhattan, New York City, one of the world’s busiest pedestrian intersections and a major center of the world’s entertainment industry. Hence, blocking out the noise and distractions while practicing yoga wasn’t an easy task. However, it was a great concept to promote yoga and to teach these individuals that if they have the right mindset and mentality, it can be accomplished. This will allow them to have a better control of their mind and to cope better when they are placed in a stressful situation. At OMG Yoga, we provide yoga classes in Singapore. Students will be able to have classes at the comfort of their homes or if the prefer, outdoors in a park or an open field. They will provide them with a unique experience! For more information, please feel free to check us out at our website.